Last post, we were running with the name game, which emphasizes one of the two features of organic chemistry, its precision and logic. The other distinguishing feature, as in all chemistry, is the sense of cooking and transformation that we only hinted at: we had only one group of compounds, the alcohols but we did predict that the more the structure looks like water (the greater the percentage contributed by the OH group) the more water-soluble the compound was. The last post finished with a quiz, for which I will now provide answers. If you already know the answers and want to see new stuff, you can jump ahead. Q1. The rule: find the longest continuous chain of carbon atoms, five in this case. Consider as if it were derived from the five-carbon hydrocarbon, pentane. (“As if” because the real compound may not have been derived from pentane). Look for substituents (attached to the main chain. There is a one carbon substituent, that is, a methyl group. Which carbon is it attached to? Count the carbons, trying each end. Use the one with the lowest number : 2-methyl pentane (not 4-methyl pentane). The compound is an isomer of hexane but the name is unambiguous which is the idea. Q2. Same rule. Find the longest carbon chain. Four carbons = butane. Find the functional group, alcohol. Always use the lowest number so it is a 1-butanol (not 4-butanol). One methyl groups, so this compound would be called: 2-methyl 1-butanol. Q3. Find the longest carbon chain. Don’t be misled by how the structure is laid out on the page. (The way it is written will be determined from the chemical context). This is an 8-carbon compound, an octane backbone. Find the functional group, an alcohol. Always use the lowest number so it is a 2-octanol. The methyl groups on carbons 4 and 5 means this compound would be called: 4, 5-dimethyl 2-octanol. Q4. The functional group (if there is only one) is always on carbon 1, so you do not have to specify that. Note: carbon 3 is indicated twice. Q6, 7. Pretty much obvious variations on the standard rules. Where we’re going. The new functional group is the carbonyl, C=O, a group that has two chemical bonds between carbon and oxygen. When the carbonyl group is at the 1-position, that is, at the end of the chain of carbon atoms, the compound is called an aldehyde. When, someplace else in the chain, the compound is called a ketone. The principle: compounds that have more than one functional group have a different classification — sometimes the properties of the compound are the sum of the properties of the functional groups and sometimes they interact to give totally new properties. Compounds that have both a carbonyl group and an -OH group are called sugars, that is, the sugars are polyhydroxy aldehydes and ketones and are sometimes referred to as aldoses and ketoses. Sugars and their polymers and derivatives are called carbohydrates. (Alcohol, that is, ethanol is not a carbohydrate). Start with aldehydes: Once again, the name game is a good idea. If you can give a correct name for the compound, then you have identified where the functional groups are and that’s where the chemistry lives. A compound with a C=O group at one end is called an aldehyde. Formaldehyde.The simplest aldehyde could formally be named as if were a derivative of methane. Drop the final -e and add the suffix –al. Methanal, however, is a very common substance and is always called formaldehyde. Acetaldehyde. Drop the final -e from the 2-carbon hydrocarbon, ethane. Add the suffix -al. Like formaldehyde, ethanal is a common compound, especially in biochemistry and it is always called by the familiar name acetaldehyde (accent on third syllable). The conversion of ethanol to acetaldehyde is the first step in the liver’s processing of ingested alcohol. Conversely, microorganisms that carry out alcoholic fermentation, convert sugar (in many steps) to acetaldehyde and then to ethanol (faites attention: you are making the transition from organic chemistry to biochemistry). Aldehydes are chemically reactive; acetaldehyde can react with proteins of the body and is fairly toxic accounting for some of the side effects of excessive drinking. In normal people it is cleared by the next step which incorporates the compound into metabolism; people with genetic abnormalities in metabolizing acetaldehyde (common in the Asian population) are pretty much incapable of drinking at all because of the severe physiologic responses. 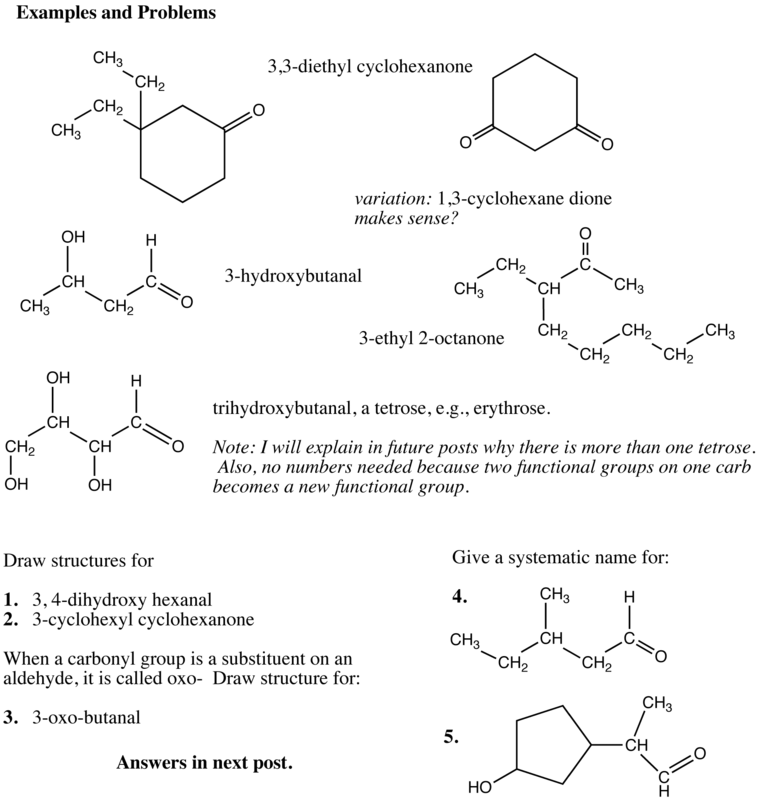 The system of naming aldehydes is perfectly regular and it should be obvious how to name aldehydes of 3-carbon (propanal), 4-carbon (butanal), 5-carbon (pentanal) aldehydes, etc. The rules for substituents are the same as before and you should be able to write the structure of, for example, 3,3- dimethyl hexanal. Aldehydes can be complicated and tend to have fruity or complex aromas and are, in fact, found in many natural products. Cinnamaldehyde and citronellal smell just the way you think. Veratraldehyde was probably first isolated from a plant called veratrum but from one of its common names, methyl-vanillin you can guess where it is used in the food industry. If the carbonyl group appears in the middle of a chain or ring, the compound is called a ketone. The simplest is the three carbon compound acetone; formal name would be derived by dropping the -e from propane and adding the suffix -one although this is never used. Ketones should not be confused with the colloquial “ketones” meaning ketone bodies, the compounds produced during starvation or low-carbohydrate diets which include acetone, acetoacetic acid (a keto-acid) and β-hydroxybutyrate which does not have a keto group at all. Sugars are polyhydroxy aldehydes and ketones. Organic compounds, in general, can have more than one functional group. For names, there is a hierarchy: carbonyl compounds have precedence over alcohols. In other words, in a compound containing both an -OH group and a carbonyl, the compound is named as an aldehyde or ketone and the hydroxyl group is treated as if it were a substituent along the lines of a methyl group as in previous exercises. The alcohol groups are called hydroxy– when a substituent in another compound. There is one ketotriose, dihydroxyacetone. The hexoses. Looking ahead, the major sugars of interest in biochemistry are glucose and fructose. They are isomers (the same chemical formula) but glucose is an aldose and fructose is a ketose. 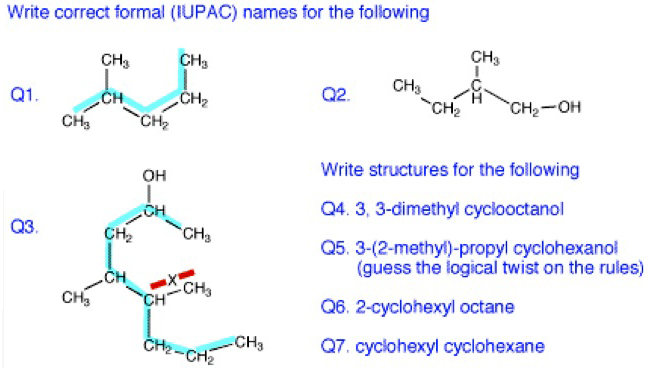 Structures are shown below but there is another level of complication, stereochemistry, that has to wait for the next organic post. With some of the major players, however, we can start to put together some information on biochemistry. Glycolysis: the lysis (breaking) part of glycolysis involves the cleavage of a hexose into two triodes. Both glucose and fructose are connected throughout the triodes. Ingested fructose can be converted to derivatives of the trioses and these, in turn, can be turned into glucose. So, can we say that sugar is special case of alcohol ? Judging from definition (wiki: an alcohol is an organic compound in which the hydroxyl functional group (-OH) is bound to a carbon atom. In particular, this carbon center should be saturated) it is. Or we can’t think like that ? That is not correct. Sugars are polyhydroxy alcohols and ketones and their derivatives. They, of course, have some of the properties of alcohols by virtue of the hydroxyl groups (like the lower alcohols, they tend to be water soluble). The way it is used by Lustig indicates a lack of precision, a lack of commitment to careful chemical practice which compromises, in my view, everything he says. On organic chemistry, again, the appeal is its logic and precision. The basic idea is that the chemistry resides in the functional groups. So, a compound with two functional groups is expected to have properties that are the sum of the properties of the different functional group (and possibly some effect of their interaction). So, for example, sugars fold up into 5- or 6-membered rings because the alcohol group (you can say that) reacts with the aldehyde to form a new functional group (called a hemiacetal) which is why you usually see sugars written in the cyclic form. So, “sugar alcohols,” or polyols (glycerol is the simplest) are alcohols in some way but again, to be precise, they have a separate name and are generally refered to as diols, triols, etc. although sugar alcohol is acceptable. Sometimes the name includes both functional groups. Keto-acids have properties of both ketones and acids. “Ketone bodies” is preferred to just “ketones” since ketones is a real category while ketone boies include a ketoacid and a hydroxyacid (and acetone which is non-enzymatic by-product of ketone body formation). If there is more than one functional group on a single carbon, all bets are off and there is a new name. So, a carboxyl group has a carbonyl and a hydroxyl group but its properties are considered completely separate and one only refers to as a carboxyl group (etymologically a combination of carbonyl and hydroxyl but chemically completely different). If their are two hydroxyls on one carbon, that is a special case known as a gem-diol (short for geminal-diol) and has special properties, and is, in essence a hydrated ketone.